Christmas cooking is really about keeping it simple and using the seasonal bounty we have here in Australia. Serve the turkey with a well-dressed green salad, or blanched green beans topped with chopped, roasted macadamia nuts. To finish, I usually boil potatoes, cut them and pan-fry them until they're crisp. Place the pitted cherries in a bowl with the balsamic vinegar and marinate overnight. Preheat the oven to 200C (180C fan-forced). To make the stuffing, heat a splash of olive oil in a frying pan. Add the onion and garlic and cook over a low heat for about 5 minutes, until the onion is soft. Remove from the heat and set aside to cool. Blanch the spinach in boiling salted water until just wilted, then drain and rinse under cold water. Squeeze out any excess water, then chop coarsely. In a medium bowl, combine the onion mixture with the spinach, ricotta, herbs, sultanas, macadamia nuts and butter. Crack in the eggs, season with salt and pepper and mix well. Place the turkey on a chopping board. Carefully work your hand under the skin of the breasts and legs to make cavities, then gently work in the stuffing until it is firmly packed. Put any excess stuffing in the bird's cavity. Rub the skin with plenty of olive oil and season inside and out. Reduce the oven temperature to 50C, cover the turkey with foil and rest in the oven for about 20 minutes. To serve, remove the wings, drumsticks and thighs and cut into pieces. Cut the breast into slices 1-2cm thick, being careful not to rip the skin. Place all the meat on a large platter. 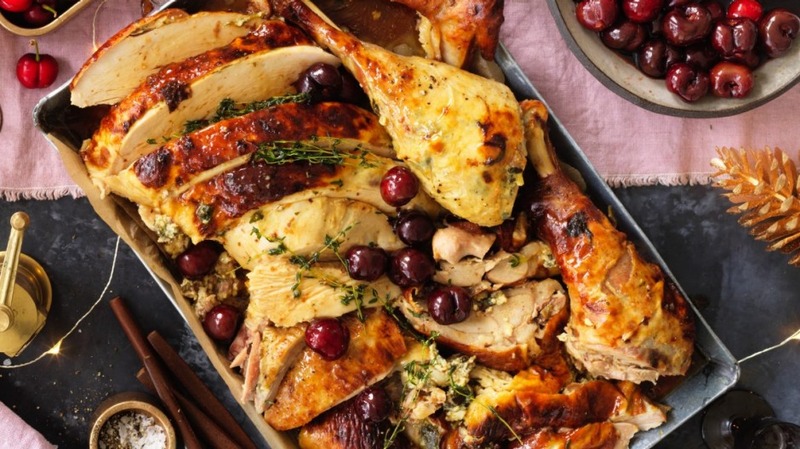 Serve the drained sweet-sour cherries on the side, so your guests can spoon them over the turkey.